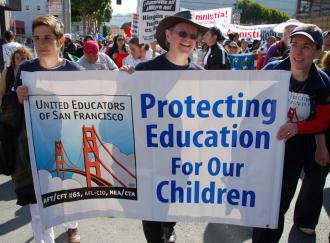 Recently, UESF, the SF teachers’ union, faced a defeat in their most recent contract struggle. Despite strong attempts to organize more militantly, including calls for strike and some work-to-rule actions, SFUSD and weak leadership of the union combined to prevent a more militant fight that could have won much more meaningful gains for the teachers and students of San Francisco. Since then a couple reflections have come out from teacher-organizers in the union. Both of the reflections we republish below originate from members of Educators for a Democratic Union, a reform caucus within the union, although the authors of both perspectives want to be clear that the perspectives do not represent the official opinions of EDU as a whole. “Changing Our Union, Not Just Our Leaders” By Adrienne Johnstone and Andy Libson offers many structural proposals for how to transform the bylaws of the union to make it more militant and democratically controlled by the rank and file. These are intended to influence the upcoming union elections by emphasizing changes that need to happen beyond just electing new leadership. The recommendations are very useful and pertinent to our struggle within OUSD and OEA where we are facing similar issues. The only piece that we would want to add is that elected officials (which would mean bargaining team members, the president, E board, and reps) could all be immediately recallable. This sometimes seems like a drastic request but has also been a historical demand of those wishing to implement radical democracy. When, at all times, leadership is accountable to its base, it must, at all times, organize and be organized. The other document, “Ten Ideas To Strengthen Our Next Contract Proposal,” puts forth a larger picture perspective of how to wage a contract struggle to similarly make the fight more militant and democratically controlled. It adds to the first perspective the political ideas that give the structural changes flesh and life. “We need to move to becoming a class-struggle union and not just giving lip service to social justice while we do nothing to stop the constant attacks made by politicians on education and on other sections of the working class. Additionally this means we have to have leadership that is prepared to mobilize the members for striking not just during a contract but for taking direct action in the months and years between the contract. That is the only way to build meaningful relationships and militant politics with parents, students, and teachers at schools sites. Taken together, these perspectives represent key lessons developed by teacher-organizers who have just gone through a tough struggle to simultaneously fight austerity-driven administrators and a self-sabotaging union leadership. We at Classroom Struggle are happy to publish both perspectives and do our best to learn from them, contribute to them, and make them real in Oakland. Click on the image to view or download the document. “Changing Our Union, Not Just Our Leaders” was originally published on Counterpunch. The link is here. 1. I disagree that UESF should disaffiliate with our state and national affiliates. A teachers’ union in San Francisco cannot operate by itself, in isolation from the rest of the labor movement. First of all, both the CTA and the CFT provide significant support for our members and our students, ranging from securing guaranteed funding for our schools to protecting our professional rights. Secondly, we see ourselves a part of the growing national movement of teacher unionists who are steering their unions beyond bread and butter unionism. Therefore, we have a responsibility to push our affiliates to fight consistently for such goals as universal access for free public education, progressive taxation to fund the public sector as well as fighting high stakes testing. What we should do is to establish full transparency on dues structure, budget and revenue. 2. I disagree that all union resources should be put to a strike fund. Going on strike is our most powerful weapon. UESF should stop using strike talk solely as a means of bringing pressure to the negotiating table. However, a strike is not the only viable weapon of politics and solidarity in the UESF arsenal. Preparing for an eventual contract fight is only one part of an effective union’s mission. In order to transform UESF and build real member empowerment and participation, a new UESF leadership will have to dedicate major resources to sustain contact between UESF leadership, staff and members, build membership empowerment between contract cycles at sites and among specific constituencies (ECE/pre K, paras, subs, retirees,etc) , and promote member communication and activity on important contractual and other issues, including building and actively participating in alliances to defend housing rights, immigration rights and to fight police brutality. I disagree that all union officers must work part-time at a school site. UESF is a union with almost 6000 members, including classified and certificated, early educators and TK-12 teachers. If we want a more effective union that fights for social justice in our ranks, in our schools and in our community, it is reasonable to have a limited number of full-time officers. This entry was posted on February 9, 2015 by ClassroomStruggle in Field Notes & Perspectives, News & Analysis, Vision & Strategy and tagged OEA, San Francisco, SFUSD, Teachers, UESF, Unions, Vision & Strategy, Workplace Struggle.